Giorgi Ugulava, political ally of Mikheil Saakashvili and former mayor of Tbilisi, has gone behind bars. Behind the charges of corruption may stand a darker motive – a desire for revenge. In a terrible week for the Georgian judicial system, Giorgi Ugulava, former mayor of Tbilisi, has gone behind bars. Within days, several signs of blatant politicisation of the case emerged, including pressure on the judges, procedural mistakes and hesitations resulting in a very dubious sentence of four and a half years imprisonment. This sentence could blemish the reputation of the current government for some time. The Georgian Dream coalition came to power in 2012 precisely on promises to restore justice after a decade of rule by President Mikheil Saakashvili. While Saakashvili may have de-corrupted the courts, many experts believe that he did not de-politicise them. The warning sign came on 16 September, when Georgia's Constitutional court declared the holding of an accused person in pre-trial detention for over nine months unconstitutional. By this time, Ugulava had been in pre-trial detention for 14 months due to a series of new cases opened against him after February 2013. These cases mostly concerned the misspending of public funds. Ugulava, a key figure in Saakashvili's United National Movement (UNM), dismisses these charges as politically motivated. The opening of new cases against Ugulava thus automatically started a new pre-trial detention period, sometimes after re-qualifying the charges. Georgia's General Prosecutor invoked one of the clauses in the criminal procedural code adopted by the UNM's parliamentary majority in 2010 that permitted the extension of the nine-month pre-trial detention in case of new charges. Finally, the Constitutional Court declared Ugulava's pre-trial detention for over nine months unconstitutional. The most blatant attempt to prevent Ugulava's release came from one of the nine Constitutional judges, Merab Turava, who was appointed last March by lawmakers from the ruling coalition. Turava refused to sign the decision made by his court, first on the pretext of ill health and then by claming that he actually needed more time to examine the verdict. This gloomy picture became even bleaker when the judges of the Constitutional Court came under pressure. 'Certain individuals are rallying outside the judges' homes, blocking it and making threats and calling for physical retribution, endangering the security of members of the Constitutional Court, as well as that of their familes,' stated Giorgi Papuashvili, Chairman of the Constitutional Court, on 18 September. Ugulava was finally released the evening of 17 September. But only for 24 hours. On 18 September, late evening, Ugulava was arrested inside the court building, where he was sentenced for allegedly having siphoned off 4.1 m Georgian lari (£1.1 m) of public funds by creating 760 fictitious job positions to reward UNM party activists in 2009. Ugulava originally received a nine-year sentence, but it was reduced by half under a December 2012 amnesty act. Davit Kezerashvili, former minister of defence under Saakashvili, was acquitted (in absentia) in the same trial. Ugulava and Kezerashvili were both acquitted the same day from another set of charges concerning the takeover of Imedi TV, a privately-owned channel, in 2008. Mikheil Saakashvili was also implicated in this case. Keen observers of Georgian politics could have predicted the unexpected decision of the Tbilisi city court. Two prominent MPs from the ruling Georgian Dream ruling coalition, Giorgi Volski and Tamaz Matchiuri, predicted on 18 September that Ugulava would spend the next night behind bars. Since charges were launched against UNM’s main leaders, including Vano Merabishvili, former minister of Internal Affairs, who was jailed for five years in 2014, suspicions have been raised about how Georgian Dream has promoted selective justice aimed at its political opponents. This declaration was perceived as unwise, given Tsulukiani was speaking about political opponents who – although their government had serious shortcomings in terms of human rights, rule of law, and judicial independence – left their seats after a mostly democratic and peaceful transition of power (something extremely rare in the post-Soviet space). Georgian Dream members constantly remind society of the 'crimes' of their opponents. Most observers of Georgian political life think this is all about revenge. Georgian Dream coalition members constantly remind society of the 'crimes' of their main opponents. Most observers of Georgian political life think this is all about revenge. Some suggest that the country is not rooted enough in democratic culture, while others point out that Saakashvili’s team was very unfair with Bidzina Ivanishvili, the billionaire backer of the Georgian Dream coalition, who promised in October 2011 to remove Saakashvili from power (and succeeded). 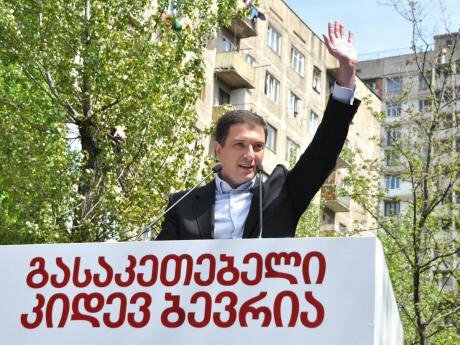 Prior to the 2012 parliamentary election, the authorities created many obstacles to Ivanishvili, accusing him of being a Trojan horse for Russian interests and restricting his ability to finance his campaign. This campaign culminated in depriving Ivanishvili of his Georgian citizenship. That said, the geopolitical dimension should not be excluded from consideration. Vladimir Ivanidze, an investigative journalist, has a theory: that it is not at all certain that Ivanishvili has sold all of his businesses in Russia, as he declared to have done in mid-2012. 'In my investigation, I gathered initial evidence about how one of his main Russian assets, Doctor Stoletov, his company active in the pharmaceutical area, was merely transferred to figureheads,' explains Ivanidze. There is also the case of Ivanishvili’s largest agricultural holding in Russia, Stoylenskaya Niva, which he declared as sold before the 2012 elections to an American investment fund. 'I discovered that this fund has no history and that the people who head it are associated with current Minister of Energy Kakha Kaladze,' Ivanidze reveals. As political scientist Jeffrey A. Winters suggests in Oligarchy, 'the common thread for oligarchs across history is that wealth defines them, empowers them, and inherently exposes them to threats. The existential motive of all oligarchs is wealth defence.' Oligarchs in Russia are certainly no exception. By bringing Putin the heads of UNM leaders – meaning the most radically pro-Western people of the Georgian political landscape – Ivanishvili could expect some reward from the Kremlin, for him and for his country. There is no proof to corroborate this hypothesis so far. But as Ugulava goes behind bars, the possibility would be foolish to ignore.